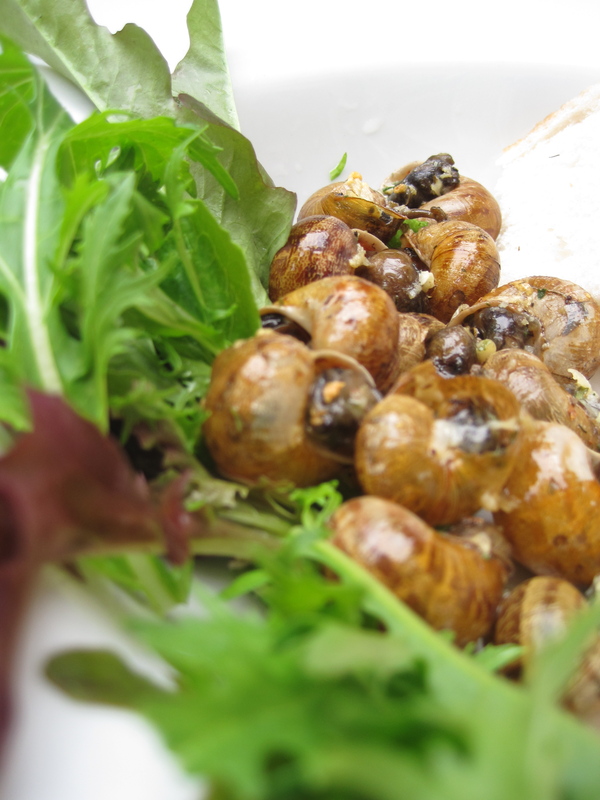 As I write this, I am on the eve of harvesting my second batch of home-grown snails, ready to be cleaned and boiled and served up with heaps of tasty garlic butter à la France. What started out more than anything as an amusing way to gross out a few easily shocked friends, and inspired in part by the foraging-related ramblings of Annie Hawes in her travel(ish) novel Ripe for the Picking, has developed into somewhat of an obsession. I am now torn between my summer-baby sunshine cravings and a dark desire for sudden downpours to lure the shell-bound little critters from their hiding places and lull them into a false sense of security that my garden is somehow a safe place for them to be. Nothing could be further from the truth – over the past couple of weeks I have developed quite the talent for spotting their camouflaged slime trails anywhere from deep in the bramble bushes in the alley to inside the cracks between my front steps. My first forage yielded 15 snails, dropping to 14 when one mysteriously vanished in the cooking process (I think one of said easily-shocked friends may have unwittingly eaten it as she gobbled her way through the carrots and onions I had boiled them up in). But you know you’re dealing with numbers far smaller than the Average French person when the only decent recipe you can find recommends quantities of butter based on cooking 100 snails at a time! This, and the fact that the long process of feeding, gutting and cooking is really a fair bit of hassle for what end up being just over a dozen shells (easily guzzled in a couple of minutes), have made me up my game this time. Outside on the patio, about fifty are now living in a big saucepan – lid on, of course – and working their way through a juicy round lettuce. This lot have been much harder work than the first bunch – hence why they find themselves holed up in the darkness of a lidded pan, being lucky to get a ration of sunlight of an evening and with their airflow limited to a tiny steam hole on the top of the pan. It has a lot to do with the larger numbers, but they have gone to lengths to escape that the others frankly couldn’t have been bothered with. First they exploited my good nature and pushed against the air holes snipped in the freezer bag I first used to house them, widening the holes to aid their escape and then all together pushing their weight in one direction to throw themselves off the garden chair their freezer bag was purched on. It was only a chance wander into the garden late one night that led to me finding four of them out of the bag and heading in opposite directions to one another – to be quickly recaptured and re-secured, needless to say. When relocated to a large fruit punnet, they quickly made it their business to worm their way between the four layers of cling film covering it – making to halfway to freedom but quite close enough. So a bag pan seemed the only way to keep them contained, while their current diet comprises a shop-bought lettuce; not the usual home-grown lettuce leaves they have been chomping until now, those having been stripped back to the roots in aid of a very nice barbecue last weekend! I have also changed tact slightly in another area since my first batch, abandoning rolled oats, which seemed to act as nothing more than a sort of cat litter for snails, itself gently rotting on the base of their then blue plastic home. In truth, my new-found ‘passion’ for rearing snails runs deeper than a casual game of truth or dare with my mates. Having first tried French escargots many years ago as a young child, I have thought about the idea of growing your own for quite some time. I had always been convinced, though, that there was some special type of snail caught by the French – so Ripe for the Picking did have its own role to play, I suppose, in reassuring me that the brown-shelled common garden snail is in fact the very same as appears on menus in France. It’s that reassurance that kick-started my foraging into gear, and which has reinvigorated my fascination for the amount of free food we have around us, but which we leave untouched. It astounds me that we miss out on taking advantage of the huge bounties of produce which lie untapped in our gardens, allies and parks. Snails are only one example (think wild blackberries, nettles for tea and so on…), but think of how many slither around us emerging every time it gets a little damp. The gardeners among us will curse them for getting at our crops, but the vast majority would reach for the little blue slug pellets long before thinking of catching and cooking them, just because they are a meat we don’t consider eating. In the same way as we obsess over chicken breasts in this country, eschewing cheaper, often tastier cuts like thigh and sending the majority we produce elsewhere in the world, so we would rather grab a cleaned, filleted and nicely packaged up piece of pork, lamb or beef from the supermarket – as away of getting away from the real connection between the earth and our food that comes from it – than be a little daring and see what we can cook up with something we find literally on our doorsteps. Of course, part of the problem is not knowing what to do with the things once you’ve got them. Less usual foods like garden snails are hardly the territory of Nigella’s recipe books, and instructions for cooking with them can be hard to come by to say the least. Even those you can find often bear more of a resemblance to a cross between a science textbook and some sort of family heirloom diary from the 1800s than they do a recipe. Still, perseverance pays off, and the results are more than worthwhile – particularly when you’ve caught a food few at once (that’s what those rainstorms are good for). And let’s face facts; there aren’t many meats around that come with zero food miles and not an ounce of a carbon footprint. So go on – catch, gut and boil away, and tuck in with a clear conscience. Head out during or straight after rainfall and pick as many snails as you fancy (12-15 per person is a nice number for a starter). Try and get them from plant foliage where you can, as they’ll be cleaner than those you’ll find on pavements – also avoid any from areas where you’ve laid pellets. Train your eyes to look carefully between the leaves, where they’ll often be hiding out. If you’re having trouble finding enough, get the ones you can and then head back out half an hour later – you’ll be surprised how many more have appeared in the places you just cleared, ready to replenish your stocks. Put them in any container that will allow them reasonable space to move around – depending on where you look, you’ll find advice for and against putting them in plastic (some say the point of the container is for the snails to dry out, others say they need to stay moist) but, from experience, I’ve had no problem using freezer bags, probably the easiest way to store them. Snip a couple of very small holes in the top (or they’ll escape – they’re very inventive! ), throw them in some lettuce leaves and secure the top. Leave them in the bag for 7 days, making sure they’ve got enough lettuce to chomp through to clean out their insides of any toxins. On the seventh day, put the snails in a metal sieve or colander in the kitchen sink and cover them generously with salt, so they fizz. Then rinse off the salt with cold water, and use the sieve or colander to submerge them for a few seconds in a large pan of just-boiled water to kill them. Cool them off in the sink and then use a small fork or skewer to remove the snails from the shells, setting the shells aside for later. Wash the snails in cold water, removing any dirt, and then boil them up with 1 litre vegetable stock, a chopped carrot and a chopped onion. 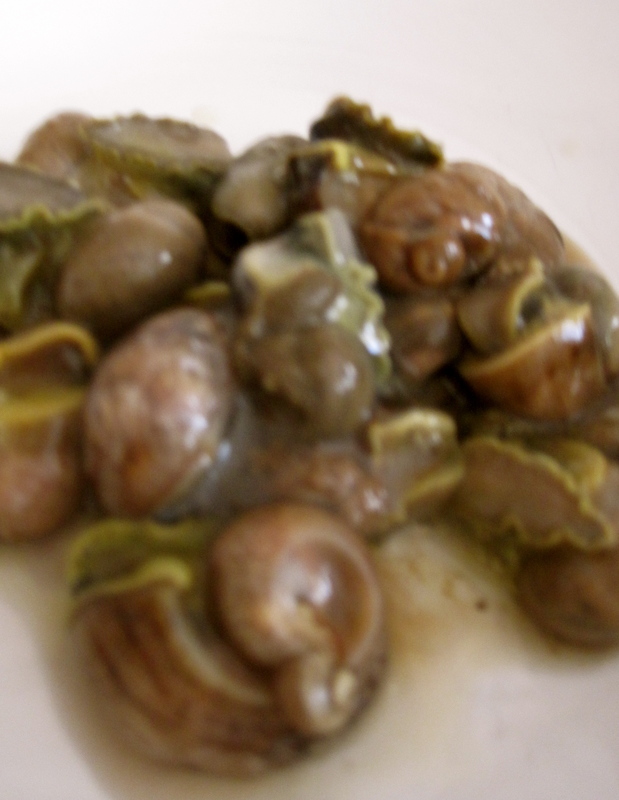 Cook for about 20 minutes, until tender – this will take longer, up to about an hour, if you have lots of snails. Meanwhile, to clean the shells, boil them four times in a pan of salted water, rinsing them in cold water each time. Preheat the oven to 200°C and bake the shells for 5 minutes to dry. To make the garlic butter, blend up the butter (5g for each snail – so 250g for 50) with 3 teaspoons of dried mixed herbs, a pinch of chilli powder and 2 crushed garlic cloves. Adjust these quantities to taste and depending on the number of snails. Drain the snails when cooked. Put a small teaspoonful of garlic butter into each dried snail shell, followed by a snail, followed by another small teaspoonful of garlic butter to seal. Bake the snails in their shells for 5-10 minutes until the butter begins to bubble. Serve with crusty bread drizzled with olive oil, a bed of salad leaves and a pot of any remaining garlic butter. Enjoy!